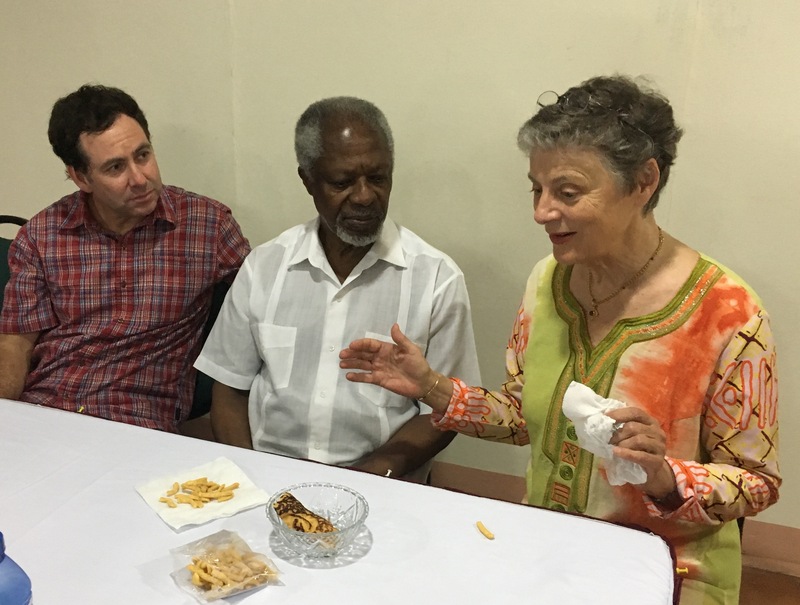 Nane Annan, wife of Kofi Annan, reflects on the achievements and challenges she witnessed at a recent events advocating for nutritious Orange-Fleshed Sweetpotato in Ghana. Last year, three scientists of the International Potato Center (CIP) won the 2016 World Food Prize for their ground-breaking work on the Orange-Fleshed Sweetpotato (OFSP) – a highly nutritious crop rich in dietary vitamin A, which can fight stunting and help prevent blindness caused by malnutrition. In January this year, my husband and I made a trip to Ghana’s greater Accra area and Cape Coast to learn from a coalition of partners, led by CIP, who are promoting this crop to combat malnutrition and contribute to economic development in the agricultural sector. Good progress has been made since we started our promotional activities in the spring of 2015. Let me share with you a few success stories: Mr. Emmanuel Darkey, an entrepreneur with a strong innovative spirit, is incorporating OFSP into a number of products, including bread, biscuits and the popular West African food, gari. He strongly believes that sweet potatoes not only provide an agricultural response to the problems of child malnutrition and hidden hunger, but also present a good business opportunity. Mr. Darkey is supplying OFSP from smallholder farmers throughout Ghana to supermarkets such as Shoprite and a company called Eden Tree – a vegetable grower and processor, that is just starting to process OFSP into wedges and fry-sized sticks, potentially attractive to the fast-food and catering markets. These efforts have also gained the interest of Partners in Food Solutions, a non-profit organization which aims to increase economic development by focusing on the middle range of the value chain. We also met again with Mrs. Veronica Konu, a baker from the Volta Region who uses purée from locally grown sweetpotatoes to replace close to 50% of the expensive imported wheat used in local bread recipes. Mrs. Konu has built her business around a roadside market, and is selling her delicious “golden bread”, which is a growing hit with passing travellers who stop briefly on their way to Togo, Benin and Nigeria. Today she employs over 150 people, the majority of them women, with whom OFSP and bread made from it are also very popular. During our meetings, I was struck by the keen interest in OFSP expressed by a number of stakeholders, including participants from the Ministry of Food and Agriculture, local farmers and processors, and members of the international community. They understand that nutritious OFSP could increase incomes and generate youth employment across the food value chain, while also improving health in women and children. Fortunately, Ghana’s new government has also indicated that it will focus on agriculture and the promotion of agri-businesses. It is important not to lose this momentum. As a next step, we have to ensure that the ongoing activities around OFSP become economically sustainable. Inclusive, market-driven approaches can be helpful in this regard, but we also need continued public and private funding to support the scaling-up of ongoing OFSP initiatives. If we get this right, it will be an important contribution to the lives of millions of Africans who still suffer from the devastating effects of vitamin A deficiency.